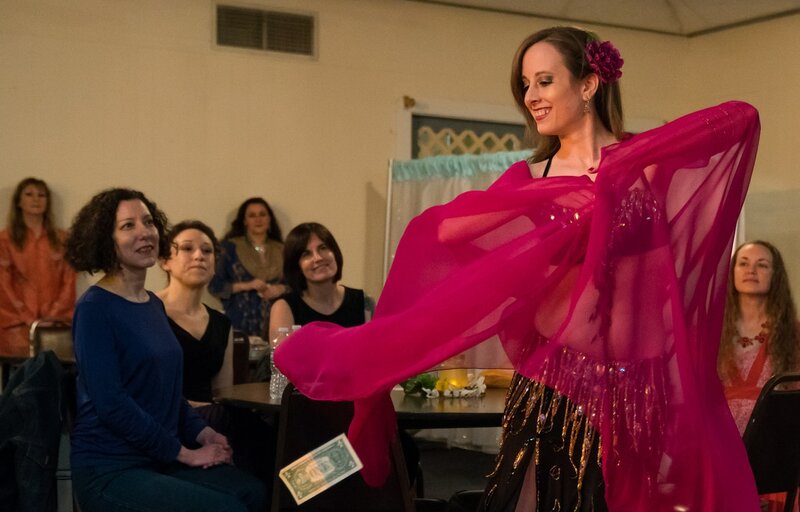 Make your party memorable with sparkling costumes, swirling veils, and beautiful dancing by booking a bellydance performance by Sahina for your event entertainment! Each performance is custom tailored based on the type of event and audience to ensure that your party entertainment is unique! Please look over the performance packages below, check the frequently asked questions, and contact Sahina to check for availability or with any questions. Visit the gallery to see video from past performances. You have worked hard to plan the perfect party to celebrate one of life's big milestones, you've planned dinner, invited friends and family and now you just need a great way to get the party started and provide your guests with top notch entertainment. Sahina has provided exquisite entertainment for birthdays, celebrations, and gatherings of all types. Want something more interactive? Consider the lesson and show package! Let's celebrate together! Are you looking for a fun and interactive way to celebrate a special occasion or just take a break from your daily routine? 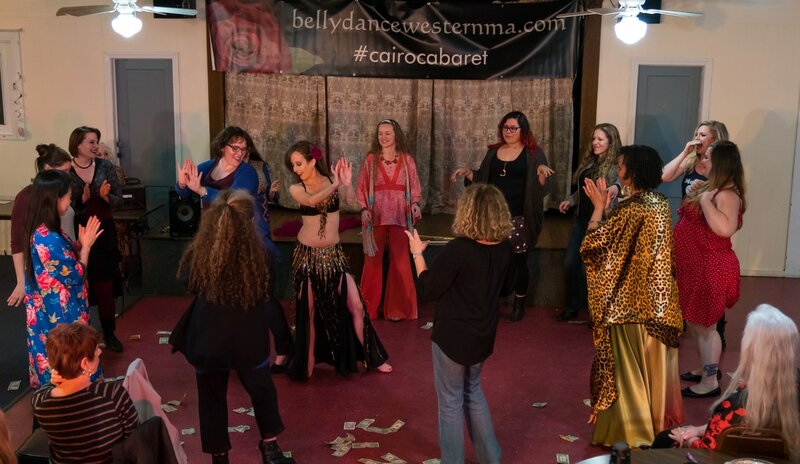 Bellydance lessons and performances are great for all different types of celebrations, some of Sahina's favorite events have been Queer Nights, wedding party celebrations, and art shows. 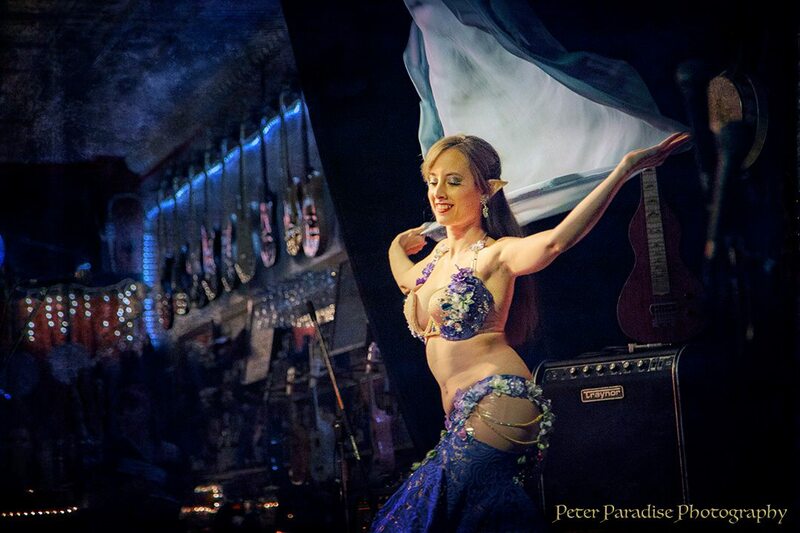 If you want to sparkle, jingle, and dance book a bellydance party customized with a lesson for you and your friends today! Whether you want a lively Turkish Romani 9/8 or a soulful Egyptian Baladi Sahina will create a wonderful show for your cultural celebration. Enjoying a dance performance complete with joyful ringing of zills and the sounds of the oud and doumbek is perfect for any occasion. We thank you for entertaining our friends and giving us a wonderful lesson. They all thought you were so lovely, a beautiful dancer and a warm and gracious woman. Thanks so much again! We so enjoyed your making our Turkish party so special! -Arlene T.
Your wedding is a life changing event and of course you want it to be perfect. 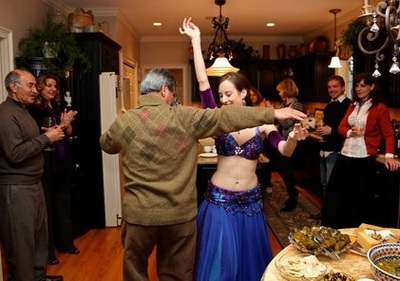 A bellydance performance creates a festive atmosphere that the whole family can enjoy. Bellydance has long been a part of Arabic and Turkish wedding traditions and is a great way to give your wedding a unique and memorable twist. You and your family and friends will be up dancing by the end of the show to celebrate your special day! Sahina loves science fiction and fantasy works and is happy to work with you on your themed event! Whether it is a Star Wars themed birthday party or a woodland fairy wedding she is happy to help to make your magical event a success! Especially if it involves dancing in elf ears! A short performance perfect for a small party. This performance features a lively veil or zill entrance, drum solo, and finale where Sahina will get your guests up to join in the dancing. Performance length is 3-4 songs, generally 10-15 minutes. Rates start at $190. 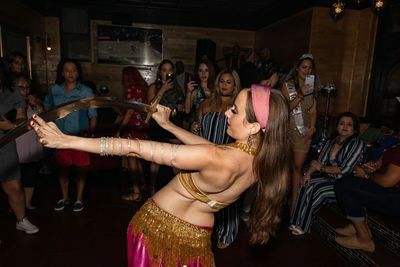 Classic Show ​This show features a full traditional routine with a breathtaking entrance, gorgeous veil dance, dramatic sword piece, drum solo, audience participation, and finale. Performance length is 5-6 songs, generally 15-20 minutes. Rates start at $235. This package is a great way to provide interactive entertainment to your event. It is perfect for a girls night in, quinceañera, bachelorette party, or bridal shower. The package includes a mini show and 30 minute lesson. Sahina will bring hipscarves for the guests to borrow during the lesson. Rates start at $275. If you would like just a lesson without the performance rates start at $125. For more information on lesson parties click here. Perfect for weddings, corporate events, and other formal occasions! This package includes an exclusive booking the day of the show, extra time for Sahina to pose for photos with your guests, and she will do her best to coordinate costume colors, music, and props with your event's theme. Performance length is one set up to 20 minutes or two sets of 10 minutes each with a costume change. Rates start at $350. Are you looking for a bigger show? 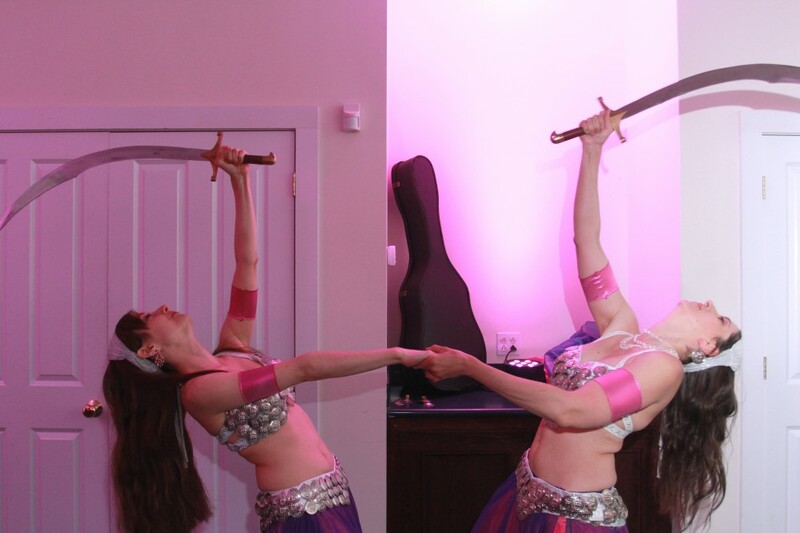 Sahina works with her dance partner Felicia and a variety of other talented dancers to create amazing performances for larger events. Rates start at $400. These are the starting rates for these packages and the final cost of your event may be adjusted to reflect travel expenses, holiday surcharges, or optional add-ons such as gifts for the guest of honor or an in person consultation prior to the event. Discounts are available for multiple performances at the same event or wedding performances that also book a lesson package for the bachelorette party or bridal shower.